This entry was posted on August 23, 2017 by katiemaselbas, in Uncategorized. Bookmark the permalink. On November 4, 1992, at 4:30 p.m., Technician Wohlers contacted a vehicle with two juvenile occupants for a traffic violation one mile east of Georgetown on Interstate 70. After calling for assistance, Technician Wohlers was shot in the head by one of the juveniles. The suspects fled before backup could arrive. At 7:00 p.m., the two juvenile suspects were arrested as they traveled from Georgetown to Denver. The car was later determined to be stolen. The juveniles were tried as adults and convicted. The suspect who pulled the trigger was sentenced to life in prison. His accomplice was sentenced to 32 years. Technician Wohlers succumbed to his injuries on November 5, 1992. Due to a statute change, the suspect sentenced to life in prison is now currently scheduled for a parole hearing, beginning September 25, 2017. 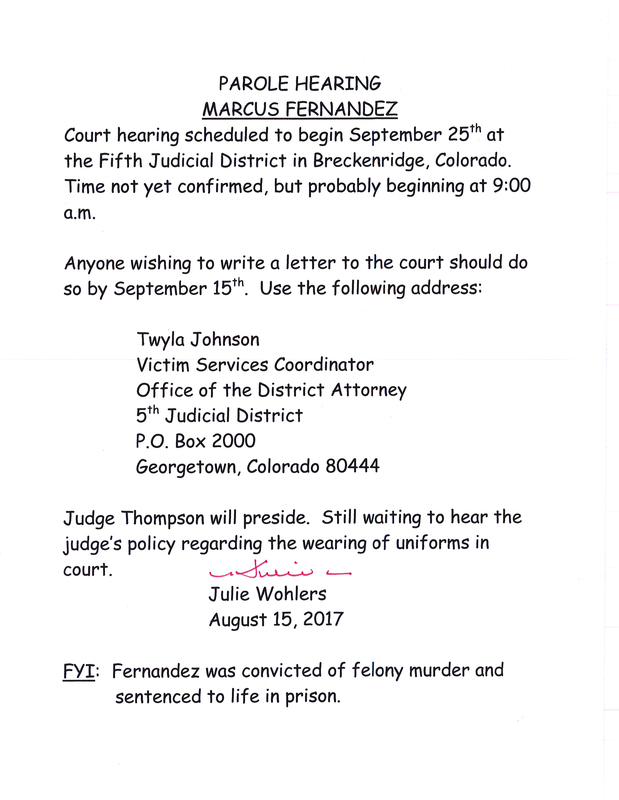 While attendance at the hearing is limited, anyone wishing to write a letter to the court is encouraged to do so by September 15, 2017. Please see the information provided by Technician Wohlers’ wife, Julie, who is also a proud, long-standing member of the Foundation’s Board of Trustees.